The Boat Racing festival is coming, we would like to make an annoucement about the service condition our customer will be expected during the period from October 22-27, 2018. Please expect a delay due to the traffic flow. If you are inside the inaccessible road, the driver will not able to pick you up. We recommend that our customers to choose the area that is very accissible as the pick up point and meet the driver there. Please expect a road closure or inaccessible road condition during this period, the driver may not be able to drop you off if your destination is inside the inaccessible road. You will still be charge based on the time and distance the driver pick you up to the drop off point, not the actual destination. 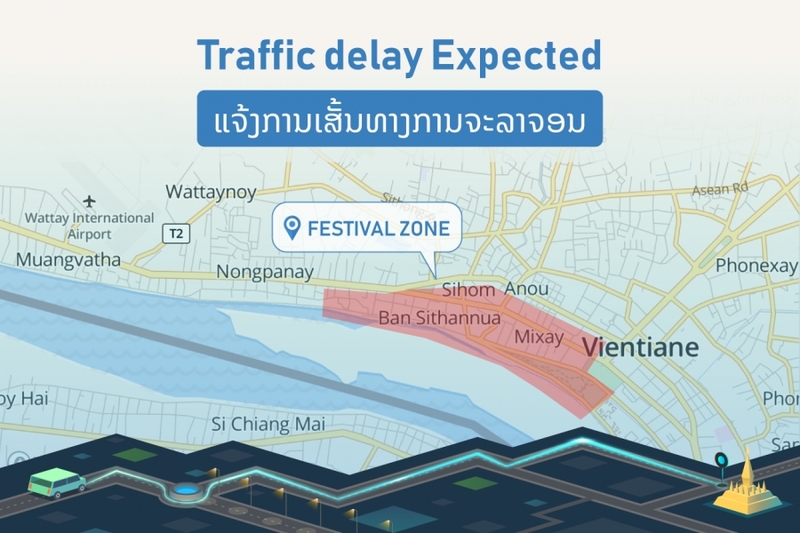 Please expect a detour to avoid the traffic and festival area; this would mean the total fare might be higher than the estimated fare you see before you book as it is based on distance and time duration. 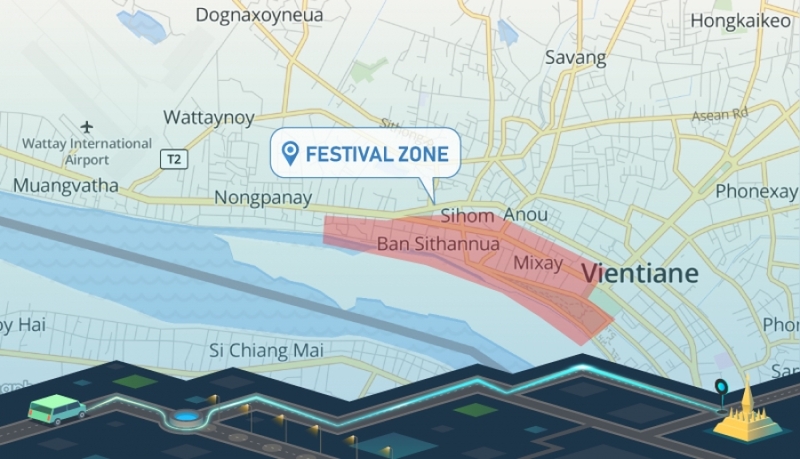 The surge price may be applied to encourage more drivers to stay online to serve you during the festival, think of it as a bonus for them because they can't enjoy the biggest festival. We will have more of our team to do a random check on the drivers to prevent alcohol consumption during this period. ການໄປຮັບໄປສົ່ງ ອາດຈະມີຄວາມລ້າຊ້າ ອັນເນື່ອງມາຈາກສະພາບການຈະລາຈອນ ແລະ ການເຂົ້າເຖິງເສັ້ນທາງຕ່າງໆທີ່ໃກ້ຄຽງ. ຖ້າທ່ານຢູ່ທາງໃນເຂດພື້ນທີ່ສີແດງ ຄົນຂັບອາດຈະບໍ່ສາມາດໄປຮັບທ່ານໄດ້. ພວກເຮົາແນະນໍາໃຫ້ທ່ານເລືອກເຂດທີ່ລົດເຂົ້າເຖິງໄດ້ງ່າຍ ແລ້ວເອີ້ນໃຫ້ຄົນຂັບໄປຮັບໃນຈຸດດັ່ງກ່າວແທນ. ອາດຈະມີການປິດຖະໜົນ ຫລື ເສັ້ນທາງບາງເສັ້ນທາງເນື່ອງຈາກມີຄົນຍ່າງເປັນຈໍານວນຫຼາຍ, ໃນກໍລະນີດັ່ງກ່າວ ຄົນຂັບອາດຈະບໍ່ສາມາດໄປສົ່ງທ່ານໄດ້ເຖິງທີ່ເນື່ອງຈາກລົດບໍ່ສາມາດເຂົ້າໄປເຖິງໄດ້. ແຕ່ທ່ານຈະຍັງຕ້ອງຈ່າຍຄ່າບໍ່ລິການ ໂດຍອີງຕາມໄລຍະທາງທີ່ນັ່ງມາ ບວກກັບໄລຍະເວລາທີ່ເດີນທາງມາຮອດຈຸດໆນັ້ນ. ອາດຈະມີການຂັບອ້ອມຕາມເສັ້ນທາງຕ່າງໆເພື່ອຫລີກເຂດ ຫລື ເສັ້ນທາງທີ່ມີການຈະລາຈອນຕິດຂັ້ນ; ນັ້ນໝາຍເຖິງຄ່າບໍລິການຂອງທ່ານອາດຈະສູງກວ່າການປະເມີນໃນເບື້ອງຕົ້ນ ເນື່ອງຈາກການເດີນທາງທີ່ຫລາຍຂຶ້ນ ແລະ ໃຊ້ເວລາຫລາຍຂຶ້ນ.